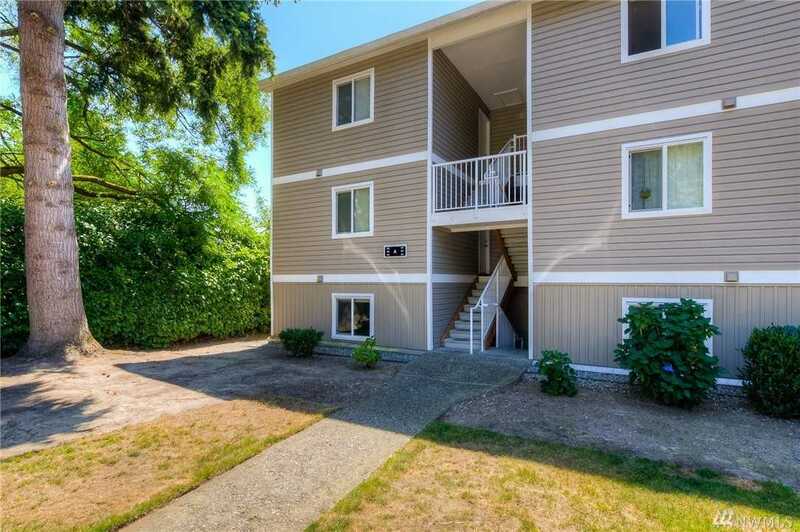 Ideal location, new paint & carpet, 1st flr end unit, tall dense hedge border for max privacy. wd burning FP w/polished limestone tile, light filled kitchen w/window, over stove microwave vented outside, serve-thru bar to dining area, covered patio, hallway multi-purpose rm (storage, pantry, closet, ofc area? ), coat closet, lg bath, W/D, spacious bdm w/walk-in closet. Clubhouse w/many amenities +outdoor pool. Renovated fm studs out prior to major remodel of complex exterior. No popcorn ceilings! Directions: Turn R at 130th Way (sign for Asbury Park & Salish Village). Immediately turn L just beyond sign. Go to end of Bldg A– lower end unit. Park in space 148 or visitor marked spaces.